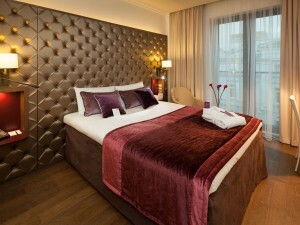 The Mercure Moscow Paveletskaya is a four star hotel located in a quiet area in the centre of the capital. It is a two minute walk from the Paveletskaya metro station and the rail station of the same name, where the aeroexpress departs for Domodedovo Airport. The Hotel Mercure offers its guests 149 stylish rooms and suites with unique designs in various price ranges, from classical standard rooms to preferred rooms with ergonomic work areas and rain showers. The interiors of the rooms are done in their own particular style, with coffee tones and high quality fabrics. All rooms have separate bathrooms with showers. On site there is the Town House restaurant, where you can evaluate and taste a collection of dishes from all over the world. Continue your unforgettable evening at the two-storey bar located in a restored part of the old town house of the merchant Alekseyev. All hotel guests have free access to the wellness centre, with its training room, sauna and steam bath, relaxation zone and various types of massages. The hotel has extensive underground parking. Business guests can use one of the eight conference halls for business events of all sorts.